written test, skill test and interview. There are total 61 vacancies available in this CG high court recruitment. Interested candidates can submit their application form duly typed on Legal bond paper and send it to the address of The Registrar Chhattisgarh High Court. This Stenographer, Assistant Grade 3 jobs recruitment will held in 3 different stages. 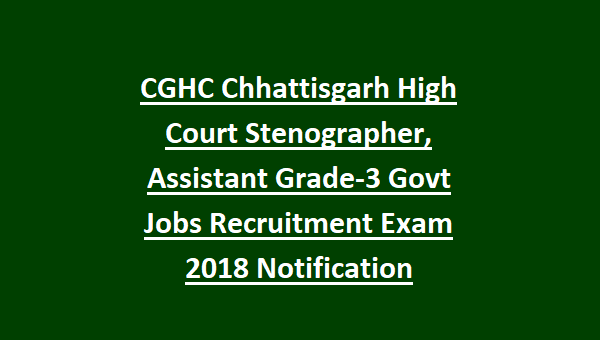 See the below given details for available vacancies, written test pattern, skill test information, application procedure for High Court of Chhattisgarh state Stenographer Assistant Grade 3 Jobs recruitment 2018. Click here to see the official notification of CG HIGH COURT Stenographer, Assistant Grade 3 (Computer) Recruitment. For Assistant Grade 3 posts Degree qualification and one year diploma in computers from ITI or its equivalent. For Assistant Grade 3 Computer-PG Diploma in Computers is required. For Assistant Grade 3 Photography-Graduation with 2 years working experience in Photocopy machine operation and working experience of computer operator. For Library Assistant-Bachelors Degree in Library Science is required. The candidate's age limits as on 01-01-2018 is 21-40 Years. For SC/ST/OBC 5 years of age relaxations are given. For exam Pattern and syllabus refer the official notification. For Stenographer Jobs- Applications form is available in official website of High Court of Chhattisgarh @highcourt.cg.gov.in. Last date to receive the filled application form along with all self attested copies of Educational qualifications, Date of Birth Certificate, Technical Skills Certificate, Caste Certificate, ID and Address proof and if any other related details is 12-10-2018. Application form should be type in a Full Size Legal Paper and on cover letter mention with all capital letter as "APPLICATION FOR THE POST OF------------------"
The Registrar General, High Court of Chhattisgarh, Bodri, Bilaspur (C.G.) by Registered Post/ Speed Post/ Other Courier/Hamdast. 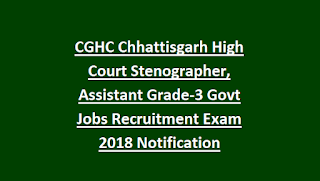 Download Application form and Notification here for CG High Court Stenographer, Assistant Grade 3 Jobs Recruitment.